Italian documentarian Gianfranco Rosi has been at Venice on several occasions, but with his new film, Sacro GRA (2013), he has graduated to the main competition. Rosi’s roam on the orbital road of the title is a fascinating, witty and meditative piece which delivers an alternative view of Rome, far from the postcard locales of the Coliseum and La Dolce Vita. The road runs round the film, like a roaring river, filled with stories whilst passing unknowingly a landscape also rich in life and narrative. There are the herds of sheep and a tree surgeon who hopes to save his palms from an invasion of a rapacious insects. Elsewhere, an aristocrat spends his days exercising and relaxing, chomping on an unlit cigar and making money by hiring his villa out to a photographer making a photo-novel; a fisherman catches eels in the river that the road crosses; and ambulance paramedics rush to pick up the pieces when the hurtling traffic claims a victim. As with previous films Below Sea Level (2008) and El Sicario, Room 164 (2010), Rosi again proves to be an unobtrusive director with an eye for the visual and an ear for interesting storytellers. There’s no narration nor separately recorded soundtrack; the tales tell themselves, and although it’s always worthwhile being wary to claims of authenticity, the voices ring unanimously true throughout. The fisherman reads from a newspaper article about eels, criticising it to his placidly sewing wife: “I should call you Penelope”. The inhabitants of a high rise neighbouring the road chat away about trivia, such as the early days of flight – “They used wicker chairs because they were light…” – but the banter and moaning gives way to the occasional stunning image. Rosi is interested in showing us the backrooms; the places we don’t usually see. He takes us into the rear of a seedy little establishment where two girls dance on the bar. We also see the exhumation of an old cemetery and the old coffins and corpses being buried in a field beside the unsuspecting quick of the road. There is no framing nor explanation, but Sacro GRA’s images are greatly compelling. A few years ago, Michelangelo Frammartino’s Le Quattro Volte (2010) brought a deeply meditative vision of remote Calabria. Rosi’s latest documentary could easily be seen as an unofficial sequel. It may lack the former’s overarching philosophical framework and ‘olden day’ pacing. 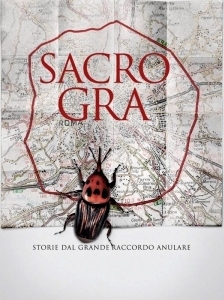 Sacro GRA is an urban version, propelled by its subject from one story to the next, and there are glimpse of poverty and alienation, but the rich tapestry of life is here. Even the ageing prostitute by the side of the road hums Nessun dorma – because this is also Italy.